I have argued for longer than I probably care to remember that the last thing we need in our economy right now is a balanced budget. When and if we have full employment, higher productivity and a confident business sector that is investing heavily and exporting at considerably higher levels than at present I will change my mind: right now we are so far from that situation that a government surplus makes no sense, in theory or in practice. The reason is that there are, in macroeconomic terms four sectors in the economy and they must balance. The first is consumer spending. If consumers borrow more to increase spending then someone must lend it to them, or borrow less, as a matter of fact. That person who must borrow less might be business, who might invest less as they borrow less to compensate for more consumer borrowing, or it might be net overseas trade, or it can be the government. 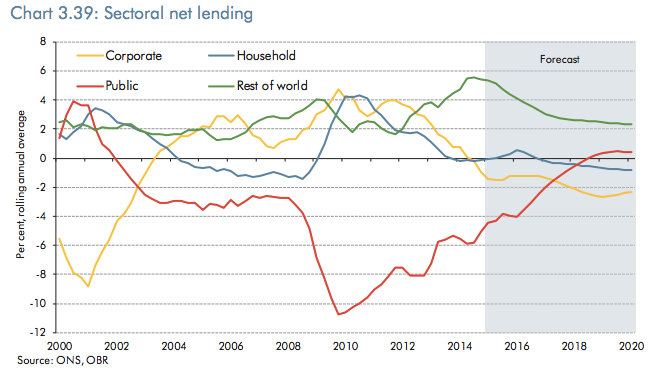 But the point is that the net lending and borrowing of these four sectors, consumers, business, overseas and government, will always balance, as a matter of fact. So, frustrating as this might be to a politician who wants to appear to be in control of the destiny of their government and the state, the fact is that they have remarkably little control over how much they will borrow. 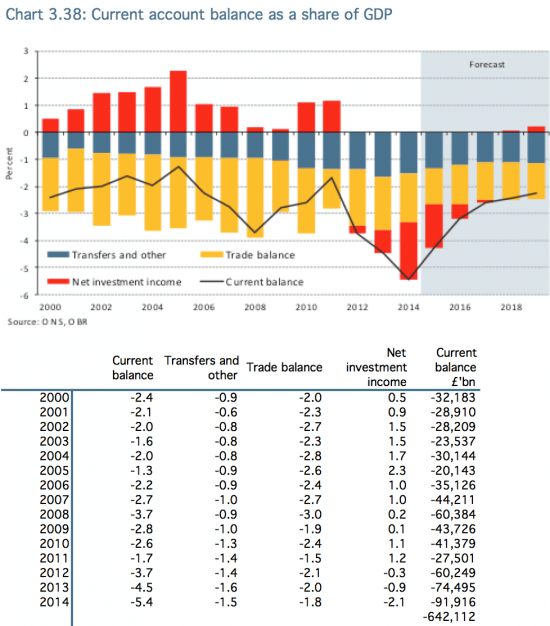 If consumers insist on saving, as does business, and trade is running a deficit, (which in effect means foreigners are saving in Britain) then as a matter of fact the government will run a deficit whether it likes it or not. And there is nothing, bar stimulating business investment, exports, or consumer borrowing that they can do to change this. All of these balances add to zero. 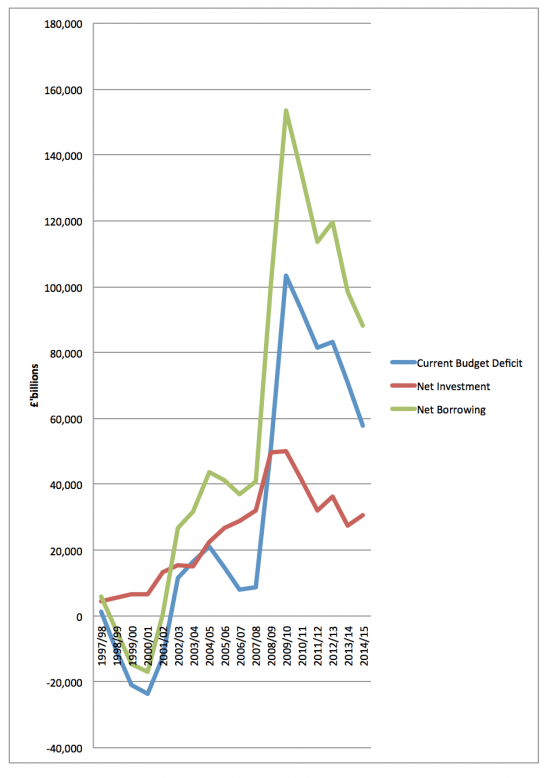 And, as is clear some factors make it very hard indeed to achieve a balanced budget, let alone a budget surplus. The only time it happened in this period, from 2000 to 2002, it was only really possible because of the enormous corporate borrowing during the dot.com era. That Labour kept the deficit under reasonable control from then on was, as is widely known, because consumers borrowed during this period to compensate for the fact that after the dot-com crisis business simply stopped net borrowing – which is why they have ended up with what Gillian Tett of the FT has called ‘zombie piles of cash’. And throughout this period note the enormous impact of the ‘rest of the world’. Because of trade and investment flows flows the ‘rest of the world’ has persistently saved in the UK throughout this period. The result has been that even if business and consumers decided to just lend and borrow from each other and always themselves equalled their flows out to zero (which is very unlikely to happen, but is technically plausible) the UK government would have, for this one reason of the overseas flows, have had absolutely no choice but, as creator of the UK currency, to have run a deficit throughout this period to meet the demand for lending that overseas savers had in the UK and which in that circumstance could only be met by government borrowing. And I stress, there is nothing the government can do about this because, unlike business and households (and the rest of the world when it is stated vis-a-vis the UK) only the government is the creator of currency that can make this equation work. It supplies this currency by running deficits. As a previous post argued, this means it must either create gilts to satisfy the demand for savings products that the actions of others in the economy demands that the government must meet or let reserves at the Bank of England accumulate, but one or other must happen. But suppose that borrowing to pay for net investment (i.e. cost net of sale proceeds) is charged to a capital account. £444 billion over this period then falls out of current account borrowing. 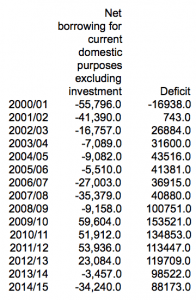 From 1997/98 to 2011/12, when QE ended, the borrowing for capital spending was £350 billion. £375 billion of QE did, of course, pay for all that. In fact, you could argue it looked suspiciously like PQE did actually take place, retrospectively, for the entire cost of state spending for that period. If PFI had been added in it would have been less, but the point is QE cancelled all that investment spend: it has now gone from the state balance sheet as debt and is now paid for with much cheaper reserves. So, we have already, in effect done PQE and still met the demand for savings. Since 2000 more than £640 billion of deficits have occurred in the UK simply because people from the rest of the world insist on saving in the UK, in sterling and the government had no choice but create the currency they need to let them do so. That effectively meant it had to run deficits for almost all that period for this reason alone. I stress: they had no real choice. 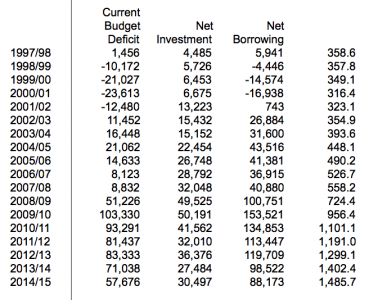 This implies the UK only ran a deficit to meet current domestic need from 2009/10 to 2012/13. Overall it ran a surplus for this purpose over the period. 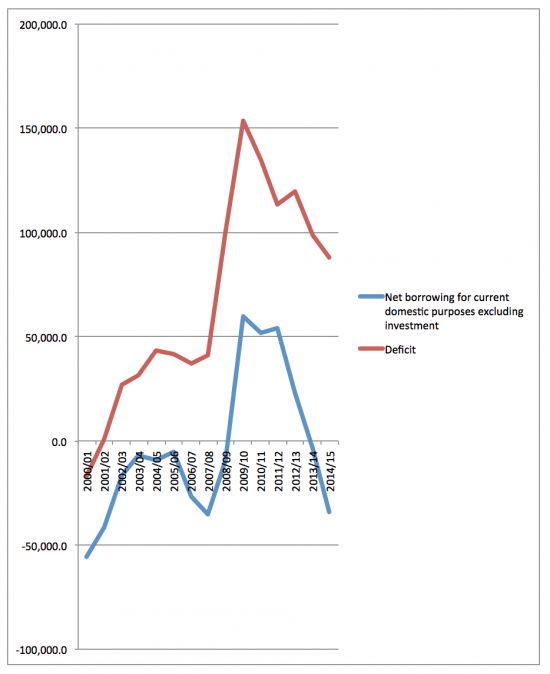 Is this a fair way of viewing the deficit? I suggest it is. I also suggest, immediately that this is not the only alternative way of looking at deficit data: I can and maybe will juggle this data in numerous other ways as yet to see what might be useful. But my points are threefold. The first is that, as I repeat, some parts of the deficit are out of the governments control. This is most especially true of the net amount of foreign saving in the UK in a time of floating exchange rates. This demand for sterling has to be met and the government has to meet it: only it can create the currency to do so, usually in the form of gilts. Not recognising this would be absurd. To also try to eliminate this would be to look a gift horse in the mouth: do we really want to stop people from outside the UK effectively subsidising us, which is exactly what they are doing, at incredibly low interest rates over very long debt repayment periods, with a fair chance that a good part of the debt will be written off by the impact of inflation in the meantime and without foreign currency risk as they are saving in our currency? I suggest not. Second, it is also absurd to lump together the borrowing for government investment with that to meet current domestic need not funded, in effect, by overseas lenders. This borrowing for investment to be accounted for quite separately. This is borrowing to fund improvements in our national infrastructure. We need this. We should be proud that we make such an investment and want to continue to do so. We should be really worried if it declines – as in real terms it is at present. That puts our well being at risk. We need a way to separately and clearly identify this spend to make sure it is properly recognised and managed. No one is going to be surprised that I think this is a role for PQE. And, thirdly, what’s left? Well, as the last graph shows, all too often it is a government surplus, much (but not all of it) happening because of increasing household debt. I am not too sure that is something we should be celebrating, and so there is an issue to consider here and how it is business surpluses that need to be addressed here. I stress: this is a quick analysis. What I am suggesting though is that the deficit narrative is far too constrained and and that if discussion of the deficit and whether or not part of government activity is to be run in surplus is to take place then we need to be aware of what the surplus is made up of, what elements might be controllable, what parts might be fundamentally useful and essentially suited to a controlled borrowing programme, and how the remaining balances need to be managed to ensure overall wellbeing of people in the country is maximised. And in the process I am saying that the deficit narrative we have suffered to date has utterly missed the point in economic terms and been deeply misleading in terms of its consequences for political economy. If we’re going to have a debt and deficit narrative let us, for heaven’s sake, make it one that is useful and based on what really happens. That’s the least the left should be doing now because if and when we do so the policy implications would be deeply significant. This entry was posted in Austerity, Economics, Government policy, Policy Documentation and tagged austerity, Deficit myth, economy, Tax Research UK by adminthinkleft. Bookmark the permalink. Remember interest payments are spent and stimulate the economy. So you don’t necessarily call them a “cost.” The spending will generate an amount of tax and an amount of saving. As it goes round and round some real activity happens and bits get lost to taxes.